This waterfront property has many great features for a fun summer vacation! The main house has 3 bedrooms and 2 bathrooms. The guest-house is above the garage and has one bedroom with a King and one bathroom. There is also a living room with 2 Twins in the guest house. Newly expanded Screen Porch and Game Room with Queen Sleep Sofa. 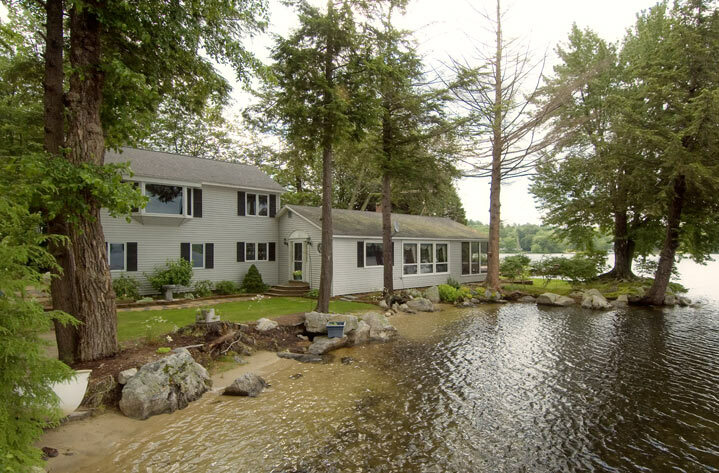 Enjoy 3 different areas to swim or relax on your lawn overlooking Winnipesaukee from many different directions with 250 Ft. frontage. 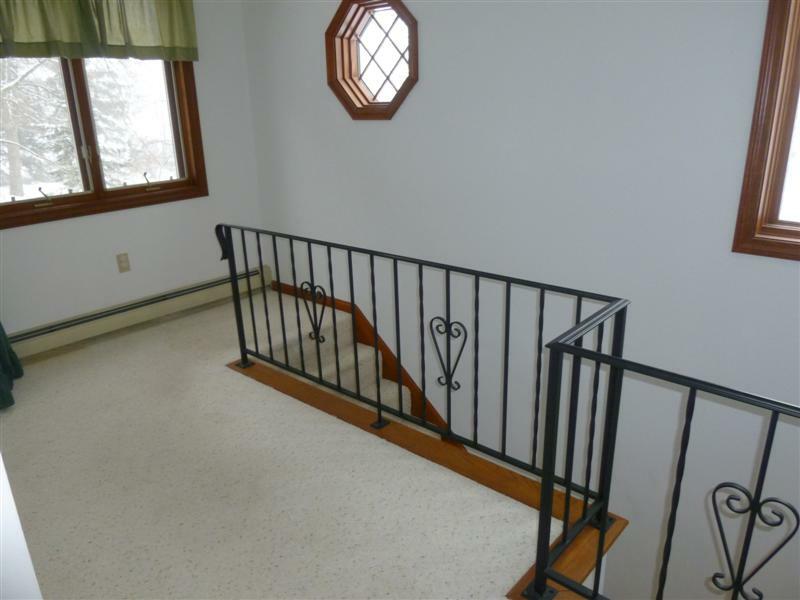 This is an ideal location on the lake for boating and is just a short drive to town for shopping. Dock will hold up to a 25 foot boat on one side and an 18 foot boat on the other side. All the amenities are here including 2 kayaks for your use. Weeks before June 8 and after Labor Day: $3,900. If you would like to rent linens, the fee for this property is $135 for sheets and $12 per person for towels. If you would like to have the beds made for you, the fee is $8 per bed. SPECIAL: JUNE 22 - 29, 2019 JUST $3,995 AND JUNE 29 - JULY 6, 2019 JUST $4,250! "Over the next few months we will be cleaning up the property. We will be cleaning the beds - cutting back the trees and branches. The grill is also being replaced for the summer of 19. We will also be replacing some of the furniture inside the house and paying more attention to the inside. Thx for the comments"
"We rented this property in 8/2015 and again in 8/2018. We love the location and the size of the house works well for us as we are two families. There were a few things that we thought could have been better. The gas grill has seen its days and the front storm door was broken. The bedroom above the garage could have been cleaner, especially the bathroom. The major compliant we have is the property is in serious need of landscaping and outside maintenance. The property looks nothing like the picture online. The shrubs and trees are so over grown. It's a nice property, but we feel it could use a little TLC. " "Great vacation, calm bay area so boat and jet skis don't get tossed around too much. Lots of areas to hang out. The pictures are outdated. There is a lot more growth around the house, pathways are overgrown, beach area is not as shown in the picture as there are now multiple 30' beech trees and lots of large bushes growing there. However, on the dock side of the house there are 2 other smaller beaches and the views are not as shown because multiple trees have grown since pictures were taken. Overall the house was clean but there were areas that had clearly not been cleaned in quite some time, dust bunnies on walls in main areas. That should not happen. Counters, fridge, microwave and bathrooms were all spotless. The set up is a bit choppy, seems to be a small "camp" that has been added on to a few times, but we adjusted to it and had a great time. " "Excellent. There are actually 2 houses on the property. the main house has 2 large bedrooms and a small sleeping porch. The other is an apt over the garage. Wonderful sunny spaces, and small sandy beach for young children. " " 1. A member of our partly is partially disabled and found it difficult to maneuver without "hand holds"for safety. 2. Could use more plastic everyday glasses." "3 generations of our family had a wonderful week at this lovely house. There was always a spot in the sun, and everywhere you looked there was a water view. Lots of sandy beach, and a great dock to soak up the sun. " "Family and I had a great time relaxing at this property. It is situated in a large cove that is protected by a barrier island and governed by a no wake zone. 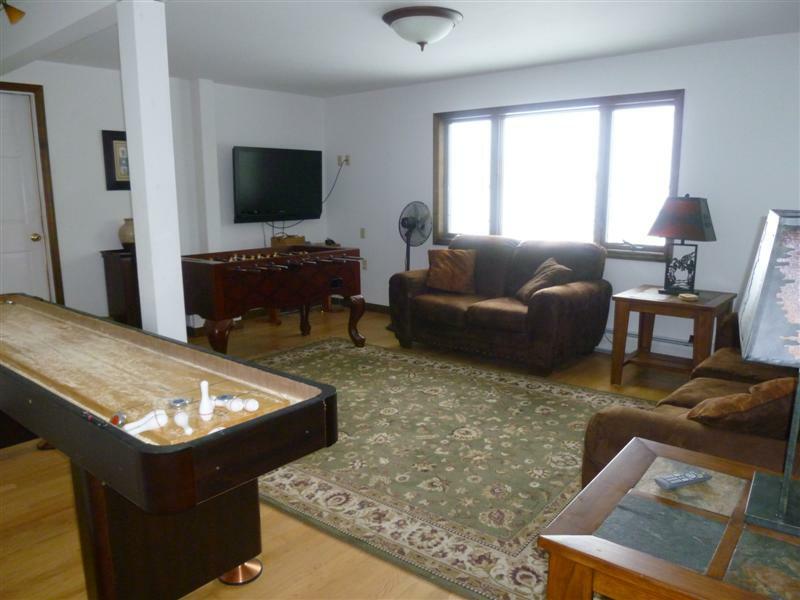 Because of these factors the location of this rental is on nice tranquil part of the lake. Our small children (as young as 2) were able to enjoy the beach outside the home without fear of the larger waves caused by the wind and boats in other areas of this large lake. We invited family to join us and they had use of the seperate quarters above the detached garage. Everyone has quiet places to retreat to when they wanted quiet time yet sufficent space for the whole family to gather as well. Two kayaks were constantly in use. Fire pit at night for smores was a hit with the kids. There is a country store about 3 miles away that has everything you could need. Suggest hitting Hannaford's supermarket on the way to the house for your full assortment of grocery needs. The kitchen has all the pots, pans and utensils you have at home. Grill was clean and propane filled. WiFi was a big help. Game room kept the kids busy on the rainy day. 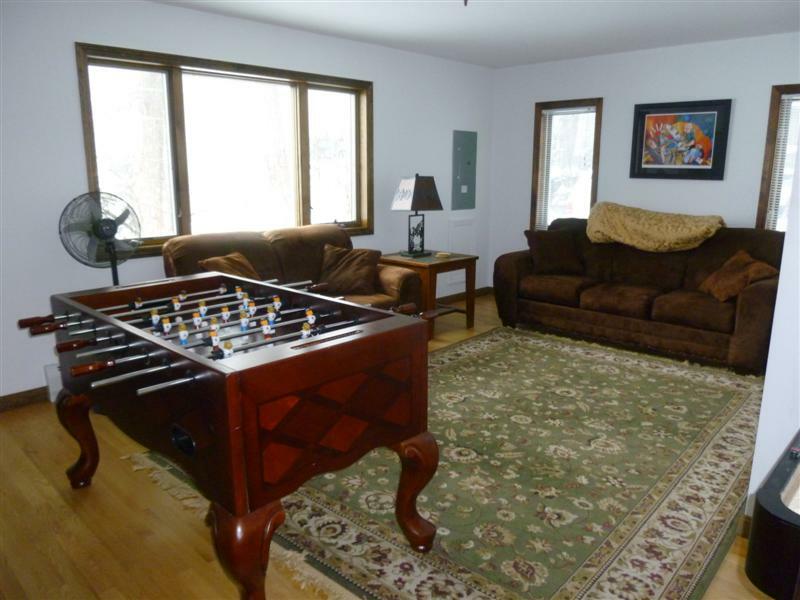 Everything you could want in a lake side vacation rental." "The house was great, the rental service employees were polite and attentive. Great location and the house has everything one would need. Very clean and organized property." "Great waterfront with two kayaks provided. Great screened in porch where our family chose to eat most evenings. Great kitchen. One of our sons as a chef, nice sized dining room table. A negative was the bedroom on the first floor  very tiny with the bathroom at the other end of the house in the laundry. The upstairs bathroom with a Jacuzzi did not have a shower the bathrooms also had the old style short round stools rather than the newer more comfortable oval stools. if the bathrooms were better and the first four had a real bedroom I would give this house five stars for location alone." "We've been renting this house for a number of years. Our group ranges from 10-80 and the house accommodates everyone. The porch is especially nice to view the lake and outdoor activities. There is a sandy beach on two sides and situated on a quiet cove. We'll be back next year!" "We had a wonderful time, the babies loved the beach and we're very safe. The cove was so peaceful and quiet the Loons were a thrill. The deck was perfect for us to get together at night and enjoy each other's company. A vacation that will be remembered for a long time. Already planning for next year!" "This property was the best. Relaxing location (we didn't know the lake area was a no wake zone! It kept the noise level to a minimum.) and great water access. Clean and well maintained. The BBQ was very clean. We had an awesome week. " "Excellent location. Plenty of room and spotless! We enjoyed the early morning visits from the ducks and geese, as well as the unobstructed views of the lake. The house is looking a little "tired"; but more than adequate for an exceptional vacation. Our only real issue with set up was the fact that there was only one shower in the main house -on the first floor; all bedrooms are upstairs. With beds to accommodate 7 or 8 people in the main house, depending on who is visiting, it was a line in pajamas in the am." "Kayaks were a great bonus, but we should have been informed ahead of time that PFD's were not provided. Screened porch was HEAVENLY. Kitchen facilities were quite good. Lots of room for guests. Game room lots of fun. Loved the shuffleboard game!" "We were very pleased with the entire experience. The staff at Lakes Region were very helpful and responsive. We were a group of six adults and 2 children and the house was perfect for us. The "guest house" (apartment above the garage) was perfect for the grandparents!! The location was great and the neighborhood was very quiet. The dock worked out very well for our 20 foot center console and the boat launch was relatively convenient. Being located on a quiet cove was great for the kids -- they could swim and float without any worries about boat traffic. There are 3 "beach" areas however only one was free of weed for swimming. The only ways the property could have been more perfect would be if the water was deeper and "weed free" off the boat dock which would have allowed for swimming over there and if the 2nd floor bathroom in the main house had a shower (jacuzzi tub only - only showers were in guest house and main floor of main house). The house was very clean and well cared for. While bathrooms were a little dated, they were very clean. We really had no complaints! Kitchen was VERY well stocked with pots, pans, appliances, etc. The screened in porch was wonderful - very happy that it had a dining table as we ate out there for almost all meals. "